The optical waveguide is the fundamental element that interconnects the various devices of an optical integrated circuit, just as a metallic strip does in an electrical integrated circuit. However, unlike electrical current that flows through a metal strip according to Ohm’s law, optical waves travel in the waveguide in distinct optical modes. A mode, in this sense, is a spatial distribution of optical energy in one or more dimensions. 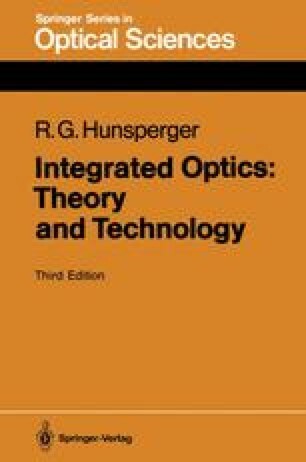 In this chapter, the concept of optical modes in a waveguiding structure is discussed qualitatively, and key results of waveguide theory are presented with minimal proof to give the reader a general understanding of the nature of light propagation in an optical waveguide. Then, in Chap. 3, a mathematically sound development of waveguide theory is given.